I had a boyfriend in college named Steve. He was from Texas and was a big ol’ Bubba. Our time together was short, as he was HIV positive. However during this time; I became very close with him and his family. Steve passed away on Christmas Day 1993. As I mention in my book, my first thoughts each Christmas morning are of Stephen and our time together. 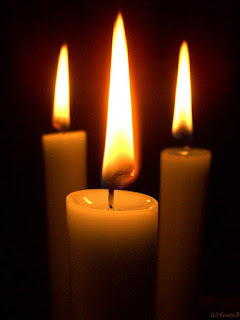 After the shooting in Connecticut, I light a candle by Stephen’s picture knowing in my heart he was there to pick up those children and their little spirits and take them to a peaceful place. I was stunned by the simple beauty of this short note and sat for a moment with tears running down my face as I remembered Steve and tried to understand the tragedy in Connecticut. We recently attended the annual Christmas in the City Cabaret at the Michigan Theatre here in Jackson. It’s our yearly break from the insanity of the holidays and the craziness the kids bring with the season. The song that stuck with me the most was their rendition of “Let there be peace on Earth” which was dedicated to those that lost their lives that horrible day a few weeks ago. I normally pass on this chestnut of a tune, but for some reason, this year it seemed right to hear. Light a candle for someone you love today and rekindle their memory during this darkest time of year. It is my hope that you and yours are well and that you might enjoy the peace that we all need and desire. 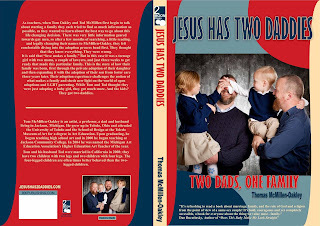 The book, Jesus Has Two Daddies, is now available for pre-order on Amazon and the Kindle/Nook version is available now for download. Book Synopsis: As teachers, when Tom Oakley and Tod McMillen first begin to talk about starting a family, they each tried to find as much information as possible, as they wanted to learn about the best way to go about this life changing decision. There was very little information geared towards gay men, so after a few months of searching, a little reading, and legally changing their names to McMillen-Oakley, they felt comfortable diving into the adoption process head first. They thought they knew everything. It is said that love makes a family. But in this case it was a teenage girl with two moms, a couple of lawyers, and just three weeks to get ready that made this particular family. This is the story of how their family was born, first through the private adoption of their daughter, and then expanding it with the adoption of their son from foster care three years later. Their adoption experience challenges the notion of what makes a family and sheds new light on the world of open adoption and LGBT parenting. While Tom and Tod thought they were just adopting a baby girl, they got much more.